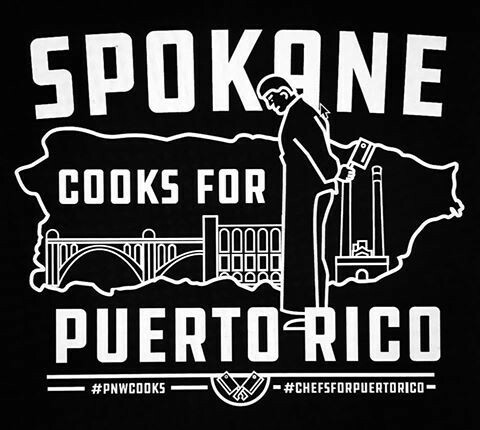 Help send Spokane chef Jeremy Hansen to Puerto Rico. Spokane restaurants — Santé Restaurant & Charcuterie, Inland Pacific Kitchen, Hogwash Whiskey Den, Common Crumb Bakery and two forthcoming spots in the Ridpath — and his team are hosting a fundraiser dinner (see more details and how to make reservations below) to support continuing, widespread efforts to support residents of the U.S. territory, many whom are still severely suffering after being devastated by Hurricane Maria last month. Specifically, Hansen and a small team of professionals in the local restaurant industry are traveling to do what they do best: cook. For most of next month, the team will join efforts led by internationally known chef José Andrés, whose World Central Kitchen has been cooking meals for the thousands of Puerto Ricans still lacking critical aid — including food and water — all across the island. Read more about World Central Kitchen’s ongoing aid efforts over the past month here. Money raised from the dinner and any other donations will mostly be used to help World Central Kitchen purchase needed supplies, Hansen says, and to distribute meals across the island. Flights and lodging for Hansen and his team have already been covered; once there, they’ll all donate their time and skills in the kitchen. “They are feeding tens of thousands a day, so our funds will be minuscule compared to what they need, but it will help,” he says. As of this writing, Hansen tells us there are about 50 tickets left to Friday’s family-style Puerto Rican steak dinner at the Washington Cracker Co. Building (304 W. Pacific), where Inland Pacific Kitchen is located. The cost is a suggested $100 minimum donation, or $1,000 for a table of 10. Hansen and his wife, Kate, hope to reach a fundraising goal of $20,000. To reserve a spot, call event partner Pura Vida Recovery at 703-7907. Friday’s dinner begins with a wine reception at 6:15 pm, with table service beginning at 7. Other local sponsors of the dinner include its host venue, Overbluff Cellars, Black Label Brewing Co., Spiceologist and Hansen’s Common Crumb Bakery. Hansen says he hopes that even after the dinner wraps up, people in Spokane remember the dire need for continued support of recovery efforts on the island. Follow Hansen and his team's work with World Central Kitchen next month on Facebook. Pick up the latest edition of the Inlander or go online to find all the latest news centering around local dining and drink. This week's issue includes stories on two recently opened spots in the region to grab a bite: Compass Breakfast Wagon on Spokane's South Hill, and Beet and Basil in Sandpoint. A version of this information originally appeared in our weekly Entrée food newsletter; sign up to get it delivered directly to your inbox here. Find last week's edition of the Entrée blog here.